Many of us saw the article last week on the Helvenston family who were told by Orlando to tear out their vegetable garden. I saw it too and was inspired to dig deeper. Fortunately, the Helvenston’s were nice enough to sit down with me for a half-hour interview over Skype. They’re not crazy, they’re not bad neighbors, and they don’t view themselves as radicals or revolutionaries. 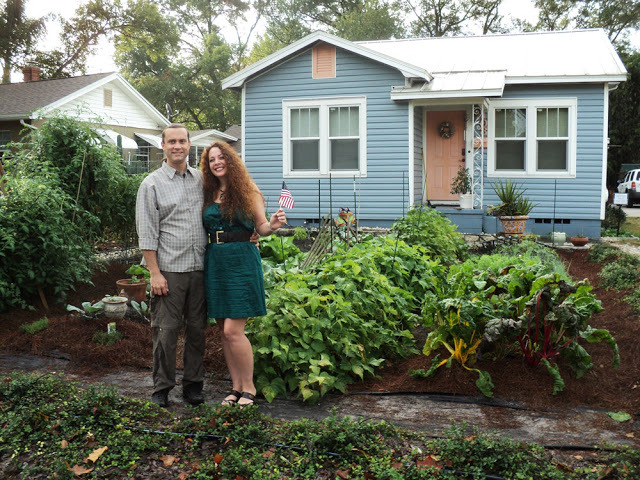 They’re just an environmentally keyed-in couple who needed space to grow food and refuse to roll over before city officials who think unproductive grass is better than organic veggies. Video on growing tobacco - check it out! Check the volume button on the bottom left side of the YouTube viewer – it may be muted. I know the volume is okay in the video. Their yard looks very nice. I don't understand what the problem is. I can't imagine they could be prevented from continuing to grow vegetables? Or is that a real possibility? It's a very real possibility. Code Enforcement currently doesn't recognize their vegetables as being proper ground cover. That IS crazy. In fact, I was reading about the different kinds of mulberries and there were so many people complaining about the fruit staining, the bird droppings staining, and tracking it into the house, walkways, etc. I grew up on a farm with mulberries lining the driveway and I only remember them being wonderful…to each their own, I suppose. . .
Sheesh. I've heard the same about mulberries. One of the most productive trees in North America and we're busy breeding fruit-less versions. If it's any consolation, I'm sure the folks that are hating on fruit trees will be the first to go in the upcoming Apocalypse. I am sure there could be a garden design mostly veggies hidden amoung the whatever the required groud cover is. While city hall can throw us out of our homes… I think the "powers that be" are awfully stupid to insist on worthless turf… to the point of throwing us out… for veggies… 2 doors down from the interstate….